These principles inspired Admiral McRaven's Never Ring the Bell Speech. McRaven’s book provides ten principles to help us cultivate the character to enjoy the journey and to live with purpose. McRaven’s talk to the Longhorns was grounded in ten principles he learned while qualifying to become a SEAL. These lessons did more than help him endure the brutal training. They helped him fight America’s wars, including the Persian Gulf War and the Global War on Terror. The latter involved the wars in both Iraq and Afghanistan and included Operation Neptune Spear — the raid that killed Osama bin Laden. These principles inspired more than the graduating class. The video of the commencement address went viral with more than 10 million views. McRaven’s book expands on the speech, adding stories from his own military service and from those with whom he served. Life is hard … sometimes there is little you can do to affect the outcome of your day. In battle soldiers die, families grieve, your days are long and filled with anxious moments. You search for something that can give you solace, that can motivate you to begin your day, that can be a sense of pride in an oftentimes ugly world. But it is not just combat. It is daily life that needs this same sense of structure. Nothing can replace the strength and comfort of one’s faith, but sometimes the simple act of making your bed can give you the lift you need to start your day and provide you the satisfaction to end it right. We cannot control the conditions of life. But we can mostly control how we respond. To that end, the principles that follow are agents of character and habit formation that allow us to better tend our little bit of the world. McRaven exhorts: Find someone to help you through life. Respect everyone. Accept that life is not fair. Know that you will often fail. Take risks. Step up when times are toughest. Stand up to the bullies. Lift up the beaten-down. And never give up. Chicken Soup for the Soul this isn’t. More like Red Meat for the Leopard Seal. All of this, I know, sounds a bit like a cat poster. But McRaven use of martial illustrations and anecdotes drawn from military life helps him avoid maudlin sentimentality. Chicken Soup for the Soul this isn’t. More like Red Meat for the Leopard Seal. As McRaven expands on his core principles, certain themes become clear. One is that details matter. I have no doubt that to McRaven, “good enough” actually isn’t. Instead, I suspect he’d say that if you shirk the small stuff you’re habituating yourself to miss important details as well. Another theme is the importance of teamwork. It’s clear that while dropping out of SEAL training is an individual decision to “ring the bell,” succeeding in the training had a great deal to do with your teammates. “No man could make it through training alone,” McRaven insists. Just as “no SEAL could make it through combat alone.” He illustrates this latter point with a harrowing account of what might be the most horrific personal injury story I’ve ever heard. No spoilers here — you’ll have to read the book. But suffice it to say it involves tangled parachute straps, a split pelvis, a chastened sense of invincibility, and a horde of friends — and a wife — to help him through. For the next six months you will undergo the toughest course of instruction in the United States Military. You will be tested like no time in your life. Most of you will not make it through. I will see to that. I will do everything in my power to make you quit! I will harass you unmercifully. I will embarrass you in front of your teammates. I will push you beyond your limits. And there will be pain. Lots and lots of pain. Fortifying McRaven’s commitment to endurance are numerous men and women who inspired him throughout his career. Many of these he met while they lay on hospital beds in war zones. Their resilience in the face of devastating personal loss fortified his own resolve to never, ever ring the bell. It’s on this point, however, that I pause. For almost all of my adult life, I’ve been surrounded by students. This included a long stint as a resident director while a graduate student living in an undergraduate dorm. So I can’t help noticing that McRaven delivered his 2014 address to one of the last graduating cohorts of Millennials. Theirs is a generation often derided as scared of commitment. Of course, they have some reason to be. Millennials grew up in an age of rapid technological turnover in which the newest gadget instantly isn’t. They saw the bursting dot.com bubble and mass layoffs. They witnessed the high rates of divorce among their parents. They have learned to be skeptical of long-term investment. A surprising number don’t buy homes or cars, join congregations or political parties, or keep their jobs or even their cell phones for long. They’re the Trophy Generation. They’re used to earning awards just for participating in, rather than winning, competitions. 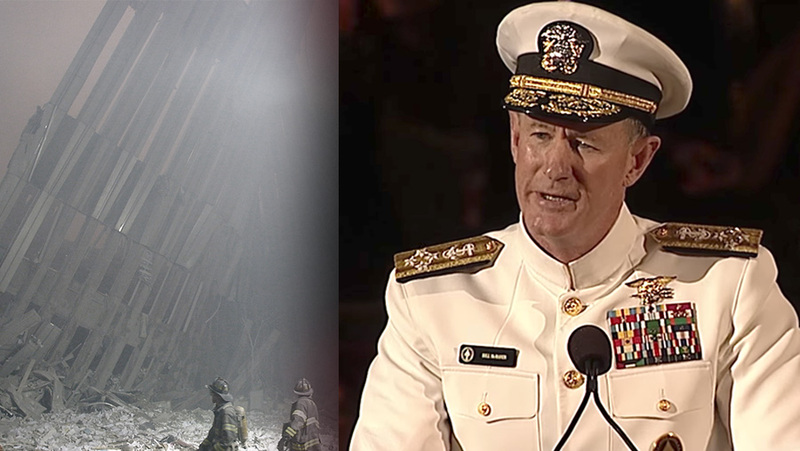 In light of his audience, is McRaven requesting too heavy a lift? Do Millennials have the resilience, endurance, and fortitude to which he is calling them? I think about many of those in that undergraduate dorm and I have my doubts. But then, I remember 9/11. In this of all weeks, we must remember that Millennials are also the generation that enlisted or commissioned in droves following that brutal attack on our country. In this of all weeks, we must remember that Millennials are also the generation that enlisted or commissioned in droves following that brutal attack on our country. They’re the generation that did so much of the fighting in Iraq and Afghanistan. Millennials formed the rank and file that won the 2nd Battle of Fallujah and pacified Sangin. If their dander is up, well, they seem perfectly capable of shouldering their share of the burden. The key, perhaps, is in recognizing another pattern. It’s telling that McRaven learned every one of his ten principles in SEAL training. There, he always had two options in front of him: Ring that bell or become a SEAL. He could either fail or he could be what he had always wanted to become. What’s the point? He had something he wanted to achieve that made the hardships worth enduring. Nietzsche once wrote that “he who has a why to live for can bear almost any how.” Holocaust survivors have sometimes attested to the truth of this idea. The Christian message commends much that is worthy of a life. More than a message of simply personal salvation, the gospel is about a return to being who we were meant to be. To being what we really want to be — if only we knew better. This way of being carries a mandate. It includes living for today, not just heaven. We’re are called to a form of dominion. We’re called to cultivate our little bit. The fatalism of the Millennial message of YOLO doesn’t cut it. We may only live once, but it will involve a death and then eternity. What YOLO gets right is that we must surely live until we die. McRaven’s book provides ten principles to help us on our way. Together they keep us grounded in the here-and-now and focused on the future prize. They cultivate the character to enjoy the journey and to live with purpose. We can both make our bed and enjoy lying in it as well. Marc LiVecche is managing editor of Providence: A Journal of Christianity & American Foreign Policy.